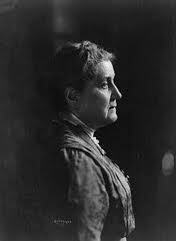 Jane Addams (1860 -1935) was the first American woman to win the Nobel Peace Prize. Addams co-founded Hull House, a settlement house in Chicago where middle-class women volunteered to uplift the communities in which they lived. She was a leader in women’s suffrage and worked for world peace. Nerdy chick Janelle Bitikofer, who is also a humanitarian, turned my attention to Addams in her interview here. Finding out about amazing people like Addams has been my favorite thing about starting this blog. Here are some of the wonderful things Addams had to say. I couldn’t narrow it down to five this time! • Civilization is a method of living and an attitude of equal respect for all people. • Nothing could be worse than the fear that one had given up too soon, and left one unexpended effort that might have saved the world. • Action indeed is the sole medium of expression for ethics. • Our doubts are traitors and make us lose the good we often might win, by fearing to attempt. • America’s future will be determined by the home and the school. The child becomes largely what he is taught; hence we must watch what we teach, and how we live. • The essence of immorality is the tendency to make an exception of myself. I added the one below, because it is so interesting. Have we had the chance yet, do you think? • I do not believe that women are better than men. We have not wrecked railroads, nor corrupted legislature, nor done many unholy things that men have done; but then we must remember that we have not had the chance. For more information about Jane Addams, click HERE. To see a compiled list of quotes from featured Nerdy Chicks, click HERE. This entry was posted in The Quotable Nerdy Chick and tagged First Woman to Win the Nobel Prize, Hull House Chicago, Jane Addams, Jane Addams Hull House, Jane Addams quotes, smart women quotes, Women Nobel Prize Winners, Women Social Activists.